We are now about to embark on crossing the Nullarbor it was too cold and too wet to head further south for us , but getting from Geralton to the Nullarbor does require a lot of driving to even get to the beginning, so from Geraldton we headed 800k’s to Mt Magnet – but nuttin there at all, so we held tight and decided to go another 300k’s to Leinister (another place without too much going for it – and now bloody freezing cold as well), but there is gold fossicking in this area, so a lot of people seem to use this as their base, it was just an over nighter in another Donga but we were tired and knew there was another big drive ahead. Don’t get me wrong, there are some lovely views etc in these areas, and we do stop along the way, but not really all that much to talk about – this trip has had its long hard slog kilometres attached to it, and yes you can stop and stay and not drive as much as we did in a day but for no real benefit as far as I can see, it’s just stopping for stopping sake and I get it if you don’t like driving, or if you are unable to do the speeds we are able to, or even if you want the trip to go for longer, but in our case this wasn’t what it was about, for me there is only so long you can look at a view or just sit around. 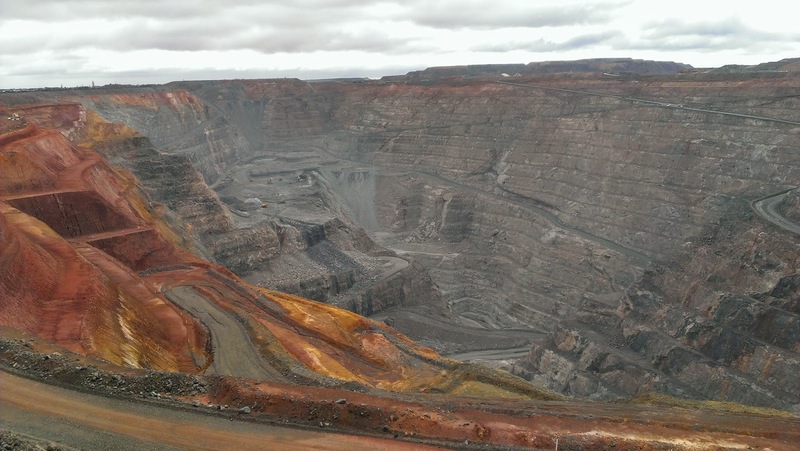 Heading for Kalgoorlie now – a very quaint town I will say, and we did stop here to look around both the town and the mines (wow they are huge), it was still quite early so we decided to push on to Norseman – which is quite a nice little town and we had a few hours exploring it in the afternoon, but it was freezing - -2 degrees over night, and nice on the tent, so it was a hard breakdown – while the day had been warm (shorts and t’s), it was all the warm weather gear in the morning. 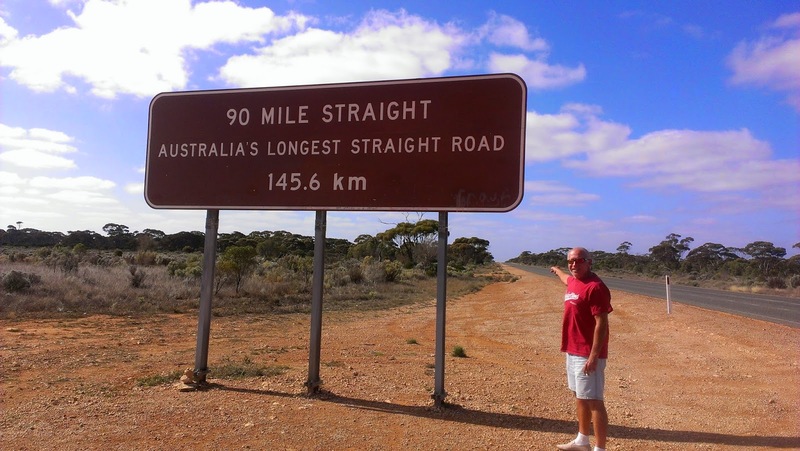 The Nullarbor is one of those iconic drives and Derek was excited by the prospect – it is a perfect drive, long straight flat roads in fact the Nullarbor has the longest stretch of straight road in Australia, it is well sealed, and you can see for miles – so a lot of kilometres can be done in a day – we didn’t have another car in front of us for 2 days and we were doing 120 ks/hour most of the time. I think we were pretty lucky, as there had been rain in the previous year so it was quite pretty with lots of wild flowers etc and not a desolate as we had expected, but we didn’t see any camels which was a disappointment. There isn’t much along the way though, and the towns that are smattered every 300k’s are really just a service station with camping and motel facilities. We stayed at Madura Pass overnight as you have to stop somewhere along the journey. We are now saying farewell to Western Australia and we are feeling a little sad, as we had such a fantastic time in WA and it had provided us with so many beautiful sights, great things to see and do and well exceeded our expectations – not today we will leave WA and cross into South Australia. 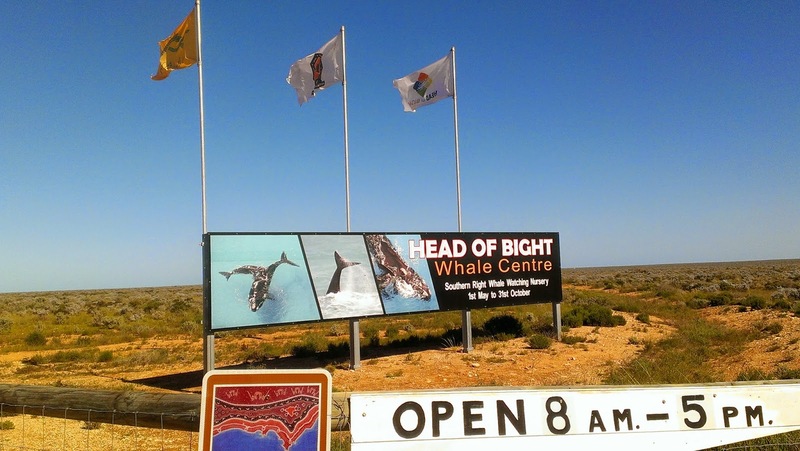 A stop at Eucla (border town) and we are told to ensure we stop at The Head of the Bight, because there is a pod of 300 right whales in town by another tourist who had just come from there– you know I hadn’t heard of it and I am so happy this person told us to stop here, because it isn’t right on the main drag (you have to turn off and go a few k’s) and it would have been one of those places that you could easily have missed, but this instantly gives you a Welcome to South Australia and the ruggard sandstone coast line – so different to what we had been seeing for weeks now, this is white rock on blue ocean and just so beautiful, and yes there were hundreds of whales here just frolicking off the coast line – while there is an admission fee it is well worth it, as the walk ways are fantastic and viewing platforms made for such a lovely morning we really could have stayed here for longer, but there are still a few hundred kilometres to Ceduna and only free camping in this area. If you are doing this drive a stop here is a must – you can’t help but smile and be excited by the views and the whales. 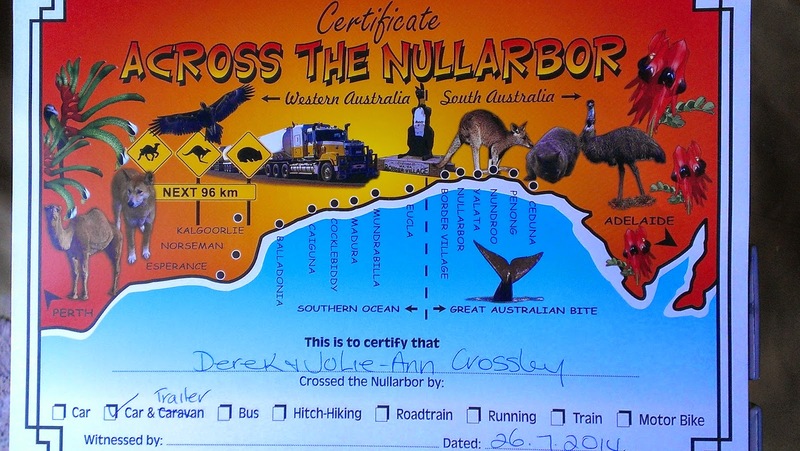 Got setup in a fantastic camp spot in Ceduna for a few days right on the waterfront, this is another one of those quaint seaside towns very pretty, lots of good drives and of course you get your certificate for having crossed the Nullabor at the tourist office. I must say we were a little surprised when we set up by the barbed wire fencing around the site and at first went what a shame because it definitely impeded on the view but lets just say the natives get restless here at night and you are immediately thankful for them. Ceduna is again one of those places where people have either just come across the Nullarbor or are about to embark on the journey so it is a friendly camping area where everyone has a story and everyone wants to share – its funny that areas like this seem to be friendlier generally like in Kununarra, Broome etc after big drives iconic areas to go through people seem to want to talk more and share. We were told that the pub here did a great Sunday roast night for $20, not having had too much restaurant food and of course no roasts for over 2 months we decided to head on over – lets put it this way it was the best food I had had for ages, and as it was a buffet and all you can eat we did make little piggies of ourselves (I hadn’t felt stuffed like that forever). 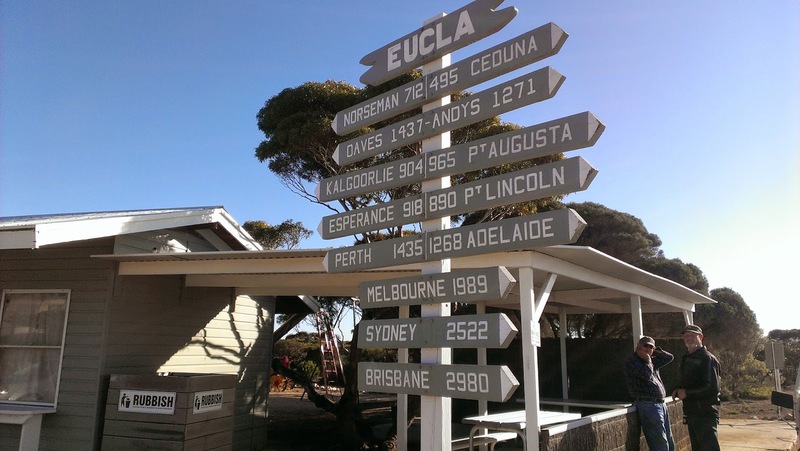 Did you know that the islands off Ceduna is where they believe the story of Gulliver’s Travels was inspired, when some Dutch sailors where ship wrecked here in the 1600’s? A few lovely days in this town and its surrounds which again provide a lovely rest in a beautiful environment, again with good drives, walks and plenty of beautiful beaches. Oysters are a plenty here so if you like them, this is a place you will love. Unfortunately we had to head off because the rains and cold where heading in. 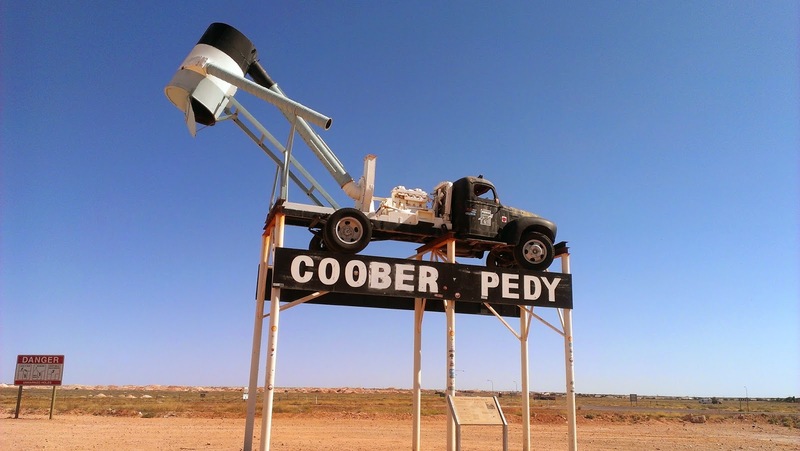 Our next major stop is Coober Pedy , but you don’t get there in a day – its a stop in Port Augusta (not much here, another big mining town) but a good rest stop and nice camp grounds – this is where we booked our night at The Desert Cave Motel in Coober Pedy – something fun to look forward to – more on that soon though. From Port Augusta to Coober Pedy takes you though some great areas like Lake Hart (and for those more adventurous Lake Eyre) both which had water in them so this was nice and something unusual to see, as well as Woomera Rocket Range and Roxby Downs area. We arrive in Coober Pedy and our luxurious accommodation – oooh the joy The Desert Cave is definitely worth the money, its an underground motel, and for $360 a night you get wine and a big box of chocolates, dinner in their 5 star restaurant and a breaky the next morning all in a beautiful room that’s underground where it’s cool and cozy. It’s pretty warm here at this time of the year, but that didn’t stop us from going out and trying our luck on the free fossicking sites – alot of fun and chats to others doing the same thing. This was a truly luxurious stay and place very up market. 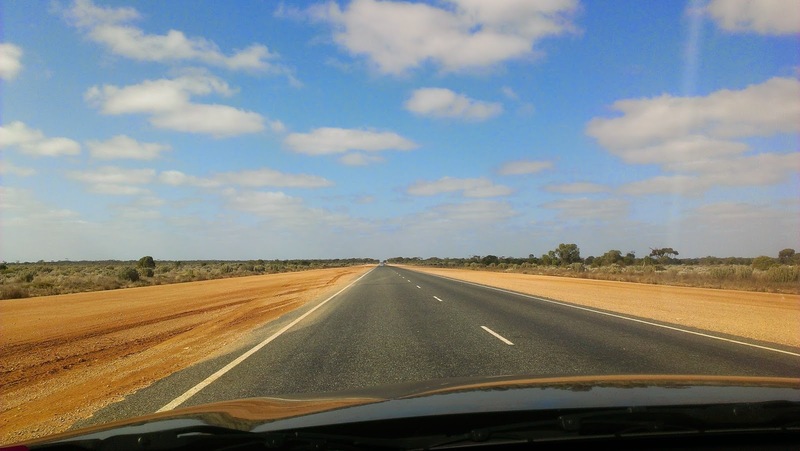 We are now getting excited to be heading to THE ROCK, but not before another long day driving, but going on the Oodnadatta Track even if only for 500m to get to Marla’s petrol station and then heading back into The Northern Territory.